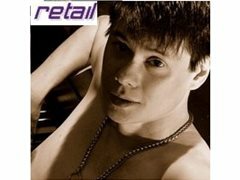 RETAIL, stage name of Gilbert Kaneda, is a steampunk singer-songwriter, guitarist, and self-taught pianist. RETAIL has topped the charts at reverbnation & the singer-songwriter, folk, & alternative rock charts on music industry site hitquarters. On myspace, RETAIL has over 27,000 followers. RETAIL's influences include THE BEATLES, BOB DYLAN, THE DOORS, DAVID BOWIE, SARAH MCLACHLAN, FRANK SINATRA, & JOHN BARRY. RETAIL names his style "mood music" because his songs evoke a kaleidoscope of moods: Sensual, romantic, atmospheric, & psychedelic. One reviewer has called RETAIL: "A twenty-first century poet with deep running roots." RETAIL evokes the past while conjuring the future.